Welcome to the Arden Craft Shop Museum. Have a look around and make sure to visit our blog page, where we will post updates on what we're doing at the museum, announce upcoming exhibitions, and much more. Please feel free to contact us via email at ardencraftshopmuseum@gmail.com. You can also follow us on Facebook and Twitter. Thanks for visiting! If you plan to shop on Amazon.com, your purchases can now benefit the Arden Craft Shop Museum! Click on the button below before you shop, and part of your purchase will be donated to the ACSM at no additional cost thanks to the AmazonSmile program. Every bit counts! 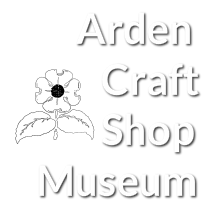 The mission of the Arden Craft Shop Museum is to collect and exhibit materials and artifacts related to the Ardens, which include the villages of Arden, Ardentown, and Ardencroft. The Arden Craft Shop Museum seeks to educate the community on the Ardens’ history as single-tax communities in addition to how the roles of theater, craftsmanship, art, and other aspects of life have affected the development of the Ardens as a close-knit community. The three Ardens, consisting of Arden, Ardentown, and Ardencroft, are Single Tax and Arts and Crafts communities. “Single Tax” is an economic theory originally proposed by Henry George, an American economist and philosopher in the late nineteenth-century. George felt that a land value tax was the most fair and equitable tax and felt that any income tax was unfair by nature. The Ardens were also founded on the ideals of William Morris, as an “Arts and Crafts” community. The Arts and Crafts movement was a reaction against the industrial revolution and valued hand-crafted goods and the incorporation of individualistic design. Arden, the first community, was founded in 1900 by sculptor Frank Stephens and architect Will Price after an unsuccessful campaign to have all of Delaware switch to the Single Tax. Ardentown was founded in 1922, and Ardencroft in 1950. Each village operates as its own municipality, but all three continue to use the Single Tax. These communities stil attract artists and craftspeople today and have many examples of American Arts and Crafts architecture. This website is maintained by the Arden Craft Shop Museum Curator & Archivist, Elizabeth Jones-Minsinger. She can be reached at ardencraftshopmuseum@gmail.com.